Women candidates throughout the Pacific have often commented that they lack the institutional, funding and other support that many male candidates receive from their political parties and communities. 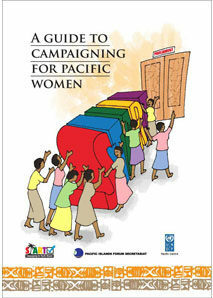 In recent years, there has been an increasing effort to specifically support Pacific women candidates. This page collects together campaigning resources from the region and elsewhere which might be of use to women running for political office. If you have a publication we have missed, please send it to the PacWIP team at pacwip@gmail.com. This booklet aims to help women who want to get involved in their own local, national and regional governance to get STARTed to take on the challenge of elections. The START strategy has been developed as a quick reference point, to help women remember some of the key issues they will need to consider and key activities they need to undertake when running for elections. It is based on the experiences of Pacific women themselves who have stood for election, drawing on their successes and the lessons they learned along the way. 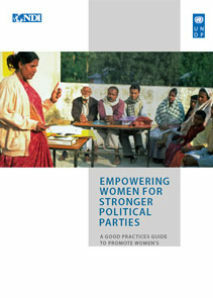 This publication identifies targeted interventions for promoting the stronger presence and influence of women in political parties as well as advancing gender equality issues in party policies and platforms. The lessons learned and common strategies in this Guide are drawn mainly, but not exclusively, from 20 case studies that were commissioned by UNDP and conducted by NDI during 2009-2010. The entry points identified are designed to provide ideas for action for political parties, development assistance providers, party foundations, and CSOs in their work to support parties. This full length version, including 20 case studies, is available in English. 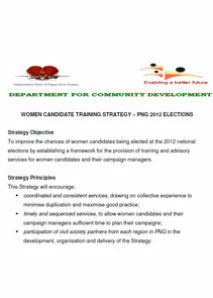 The Strategy, which was developed by the PNG Office of the Department for Women, with assistance from CDI and UNDP’s Women in Leadership Project, is a home-grown response to the poor political representation of women in PNG. ODW's Strategy aims to increase the chances of women being elected by proposing a structured sequence of training and advisory events for women candidates and their campaign managers in the 10 months leading up to the election. The planned Strategy includes a first round of regional training workshops during October-December 2011 in Alotau, Mt Hagen, Madang and Kavieng and a second round of progress check workshops during February-April 2012 in the same locations. For more information, click here. 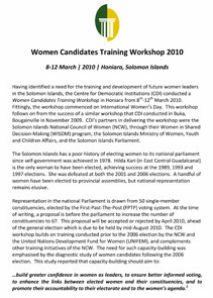 Having identified a need for the training and development of future women leaders in the Solomon Islands, the Centre for Democratic Institutions (CDI) conducted a Women Candidates Training Workshop in Honiara from 8-12 March 2010. CDI’s partners in delivering the workshop were the Solomon Islands National Council of Women (NCW), through their Women in Shared Decision-Making (WISDM) program, the Solomon Islands Ministry of Women, Youth and Children Affairs, and the Solomon Islands Parliament. The workshop was designed for participants intending to stand as candidates, or who planned to be on a candidate’s campaign team. The aim of the workshop was to equip women candidates and their teams with practical and strategic information and skills that will help enable them to realise their potential and effectively coordinate their resources to be the best candidates they could be as they contested the 2010 poll. 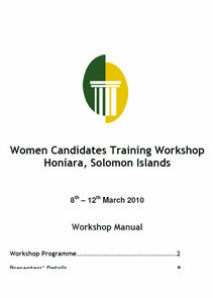 Having identified a need for the training and development of future women leaders in the Solomon Islands, the Centre for Democratic Institutions (CDI) conducted a Women Candidates Training Workshop in Honiara from 8-12 March 2010 in Honiara, Solomon Islands. The workshop commenced on International Women’s Day. CDI’s partners in delivering the workshop were the Solomon Islands National Council of Women (NCW), through their Women in Shared Decision-Making (WISDM) program, the Solomon Islands Ministry of Women, Youth and Children Affairs and the Solomon Islands Parliament.